"An extraordinary work by a gifted filmmaker, 'Counter-Intelligence' shines sunlight into the darkest crevices of empire run amok. The film vividly exposes a monstrous and unconstitutional 'deep state' in which multiple competing chains of command -- all but one illegal -- hijack government capabilities and taxpayer funds to commit crimes against humanity in our name. Anyone who cares about democracy, good government, and the future will want to watch all five segments of this remarkable film." "An extraordinary work by a gifted filmmaker, "Counter-Intelligence" shines sunlight into the darkest crevices of empire run amok. The film vividly exposes a monstrous and unconstitutional "deep state" in which multiple competing chains of command -- all but one illegal -- hijack government capabilities and taxpayer funds to commit crimes against humanity in our name. Anyone who cares about democracy, good government, and the future will want to watch all five segments of this remarkable film." "Sunshine is the best disinfectant. With Counter-Intelligence, Scott Noble is here to clean house." 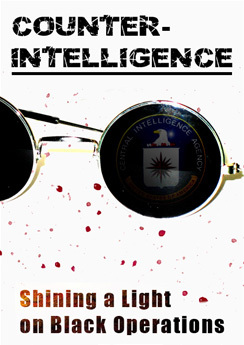 "A groundbreaking, much needed review of the structure and operational capability of America's intelligence bureaucracy." "Scott Noble may have outdone himself with Counter Intelligence. The Psywar filmmaker amassed a tour de force of power elite and deep state scholars weighing in and synthesizing decades of research. From the rise of the national security state and mass proliferation of state/corporate propaganda to the normalization of constant, now remote (drone) warfare and the ongoing decay of constitutional rights, Noble lays out some of the most significant, yet oft overlooked or outright censored information about one of the most significant issues of our times– Black-Ops. Noble helps expose the real conspiracies of the powerful factually, transparently, and responsibly. It's a film that should be screening across the US, but given the nature and subject of the film, don't count on it. Share and show it far and wide. Counter-Intelligence would be an excellent addition to college classes on political science, history, sociology, or critical thinking to spark debate and discussion, utilizing what's left of our First Amendment rights while we still can." Psuedo Operations and Counterinsurgency: Lessons from Other Countries. Theoharis, Athan G., Immerman, Richard H.
Is the Explostion-Noisy Base a CIA Spy School? What Base?